It's 'Birds Gone Wild' Out On Australia's Heron Island : The Two-Way Normally, the buff-breasted rail is a shy little creature. But on this island out on the Great Barrier Reef, it's become the avian equivalent of a weed. And the island is dotted with other pesky and sometimes (to visitors) menacing birds. On Australia's Heron Island, buff-banded rails like this one have become the avian equivalent of a weed. NPR Science Correspondent Richard Harris traveled to Australia's Great Barrier Reef to find out how the coral reefs are coping with increased water temperature and increasing ocean acidity, brought about by our burning of fossil fuels. Day 3: Waiting for a boat to the next island, Richard meets some rowdy birds. Weeds are not a true category of plant. A weed is simply a plant that's growing where a person wishes it weren't. That came to mind when I heard the story of the buff-breasted rail, out on Australia's Great Barrier Reef. It's an attractive little bird, resembling a miniature chicken. Rails are generally hard to see. They hide out in marshes and rarely show themselves. Birders mostly find them by imitating rail calls and listening for a response. It's a good day in the field when someone actually sees a rail in the flesh. But the buff-breasted rail turns out to be a rather bold character out on Heron Island, 25 miles off the Australian mainland. It has no natural predators — true of many birds on the island — so it has become downright cheeky. In fact, the rail is a pest — the avian equivalent of a weed. People lunching at the resort on this island have had to fend off the rails. The birds were all too happy to hop up on tables and help themselves. In 1998, the park service agreed to round up the population of rails that hangs around the resort grounds. They packed them all up, put them on a boat and carried them off to Northwest Island, about 12 miles away. Every year, tens of thousands of white capped noddy terns swarm the tiny island to breed. It turns out that while rails prefer to run around on the ground, they are quite able fliers. 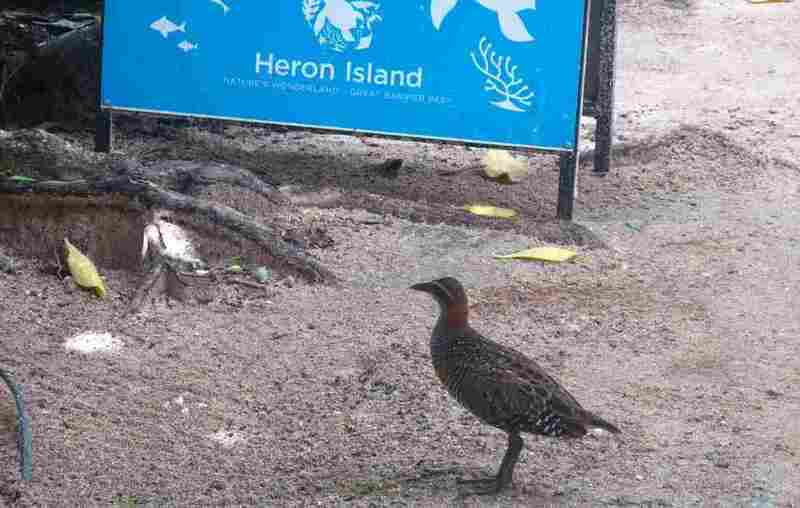 Resort naturalist Nicholas Alexander says the rails flew straightaway back to Heron Island — and got there before the rangers did in their boat. The restaurant has since put up netting to keep the birds and diners apart. People have other fearless birds to contend with, though. 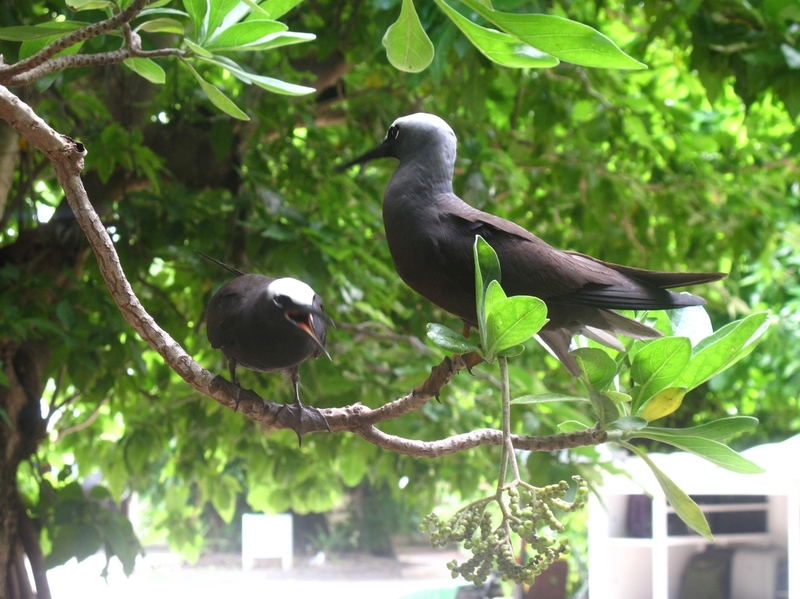 At the moment, about 70,000 birds called white capped noddy terns have swarmed this tiny island. (You can walk its entire shoreline in half an hour.) They come here every year to breed, and they make themselves quite at home, speckling the ground beneath their roosts and nests. Fair enough. They were here first. The oddest avian encounters come after dark. At sunset, wedge-tailed shearwaters arrive by the tens of thousands. They nest in burrows underground, though some simply sit on the ground, where they are a tripping hazard after nightfall. Visitors are warned that these shearwaters — known as mutton birds — also may simply fly into you as they arrive at the island. Apparently, their night vision leaves something to be desired. And the colony is awake all night, making this eerie and penetrating sound. One other note about the birds of Heron Island: There are no herons. The graceful white bird populating the island is a reef egret.